What does the term "pocket Rockets" mean in poker? What is the definition of the term "pocket Rockets" in poker? 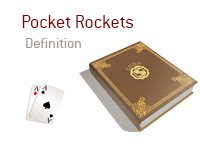 "Pocket rockets" is the term that is given to the holding of pocket Aces (A-A) in Hold'em. You are sitting in a $1/$2 No Limit Hold'em cash game at your local casino. The game is playing very loose and aggressive, and there are several very large stacks at the table. You are sitting on the button, and there have already been two raises in front of you. You look down at your hand and see "pocket Rockets", aka "pocket Aces", aka A-A. You have about $400 in front of you, and the player two seats to your right has already re-raised to $50. You decide to 4-bet up to $200. Action folds around to the player who raised to $50. After a bit of thought, he calls and turns over K-K. The board runs out 2h-2c-7h-Qd-Ah and you win the hand. "Pocket Rockets" is the best possible starting hand in Hold'em.